Indications: Medication prescribed to block type A and type B influenza. Summary Recommendations: Tamiflu is prescribed to treat symptoms of the flu. The medication must be prescribed within the first two days of the start of flu symptoms. In some cases, doctors may prescribe Tamiflu to prevent the flu. Doctors may choose to prescribe the medication for other illnesses, but it will not relieve symptoms associated with the common cold. General Precautions: Tamiflu can help fight flu symptoms, including sore throat, stuffy nose, fever and muscle aches. The medication must be prescribed before symptoms arise or within two days of when symptoms were first noticed. Patients who receive the nasal flu vaccine must wait a minimum of two weeks before taking Tamiflu. Tamiflu may not be safe for patients with kidney disease, lung disease, heart disease or other serious health conditions. Patients with a history of disease or illnesses that caused brain swelling should make the prescribing doctor aware of the condition before taking Tamiflu. Tamiflu is not a replacement for an annual flu vaccination. Common side effects of Tamiflu include nausea, diarrhea, headache, redness of the eyes, insomnia and cough. More serious side effects may include confusion, hallucinations and self-injury. If you experience mild or severe symptoms, contact your physician to report the side effects. Tamiflu samples requested on the Internet have tested positive for cloxacillin, an antibiotic. Patients allergic to penicillin may have an allergic reaction to cloxacillin. It is never safe to purchase prescription medications from companies located outside the United States. Effect While Trying to Conceive: Tamiflu has been tested for negative effects on fertility in animals. Testing revealed no difficulty conceiving when taking Tamiflu. 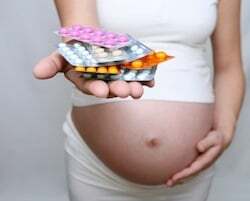 Effects on Pregnancy: Animal studies on Tamiflu show the drug passes to the fetus through the placenta. There have been cases of skeletal defects in animal offspring born to mothers treated with Tamiflu. No human studies have been completed, but the FDA urges caution when prescribing Tamiflu to pregnant patients. Tamiflu should only be prescribed if the benefits of taking the flu medication outweigh the risks. Safe During Breastfeeding: According to the Centers for Disease Control and Prevention, women treated with Tamiflu should continue breastfeeding as breast milk is an important component in infant immune system development. Breast milk helps protect the infant from illness the infant immune system is not prepared to fight. Tamiflu does pass into breast milk and thus to the infant, but concentrations in breast milk are clinically insignificant.